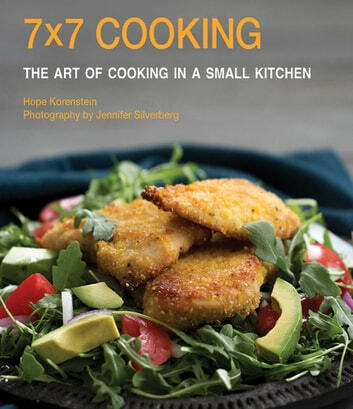 With three feet of counter space, two pans, and one pot, author Hope Korenstein breaks down how to make satisfying meals no matter the size of your kitchen. A city-dweller herself, Korenstein understands the limitations urban kitchens place upon today’s chefs: with limited counterspace, no dishwasher, and miniature appliances that make it difficult to prepare complicated recipes. Dining out or ordering food to-go all the time can become expensive; Korenstein helps home cooks reclaim their kitchens with simple recipes that address the need for low-cost, quick and healthy cooking, all while saving space. 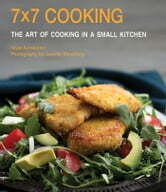 7x7 Cooking is broken down into six easy chapters: Salads and Starters, Chicken and Meat, Fish and Seafood, Pasta, Vegetables and Sides, and Foolproof Desserts. Korenstein’s recipes focus on bold flavors and few ingredients so the pantry stays manageable—and so readers avoid spending hours in the kitchen getting dinner together. With quick sautés, bakes, and broils, readers learn how to prepare easy and satisfying meals that the whole family will love. No space for a grill? Korenstein teaches you how to love your broiler. With a few helpful tips, cooking in a small kitchen has never been easier!